Scolopendrium Vulgaris.-It is always green, though it has fresh leaves in Spring. 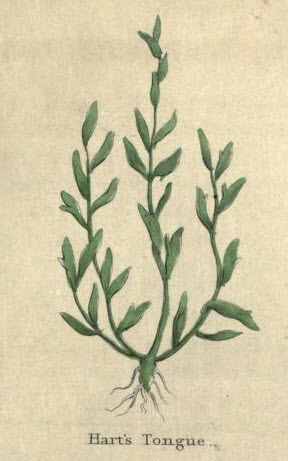 It has several leaves arising from the root, which fold themselves in their first springing and spreading: when full grown they are about a foot long, smooth and green above, but hard, with little sap, and streaked on the back, thwart on the sides of the middle rib with small and rather long brownish marks; the bottoms of the leaves are a little bowed on each side of the middle rib, rather narrow and small at the end. The root has many black threads interlaced together. It is green all the Winter; but new leaves spring every year. It is an excellent purifier and strengthener of the liver, and it ought to be more extensively known.